I only ever owned one Bad Company album and one single: Straight Shooter and Rock 'n’ Roll Fantasy respectively. So I was unsure just how much of this evening’s show I would recognise – rather a lot as it transpired. 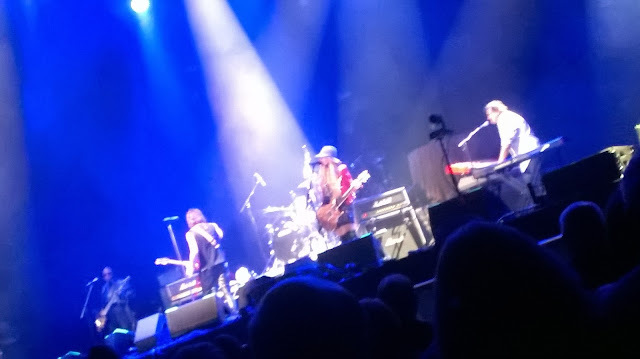 But before the headliners we were treated to a set by Richie Sambora and Orianthi – which I initially took be the former Bon Jovi guitarist’s support band. But I swiftly learned Orianthi was actually Orianthi Panagaris, the blonde elfin co-guitarist currently posing and strutting up on stage. If she just oozed self-confidence and cool Sambora, by contrast, came across a slightly bewildered and befuddled individual, at times reminding me of the character played by Richard Lewis in Curb Your Enthusiasm. And what a peculiar set list the pair came up with – opening, for instance, with a bagpipe-enhanced rendition of U2’s I Still Haven’t Found What I’m Looking For. Then sandwiched amongst numerous Bon Jovi covers, we all listened slack-jawed as Richie and Orianthi train-smashed their way through a steroid-enhanced rendition of Sonny and Cher’s I Got You Babe. That being said, the lengthy set never appeared to drag, and both of them could certainly play more than a bit. That the two guitarists are an item these days was something Sambora ensured we were all left in no doubt about whatsoever. It would be a cynical individual indeed who would suggest Orianthi's tie up with a chap a quarter of a century her senior may just represent naught but a rather deft career move. 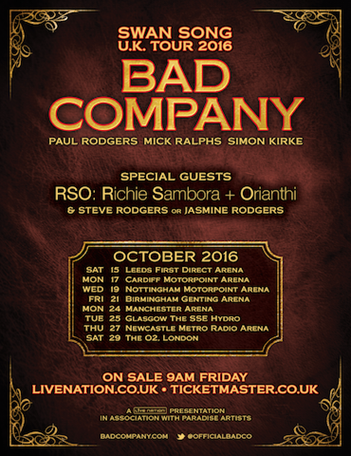 Bad Company themselves opened with Live for the Music and Gone, Gone, Gone – a brace of tunes I was unfamiliar with – before laying down one of their trump cards with Feel Like Makin’ Love. And here things just began to go a touch awry. I don’t know about you, but when I shell out £60 to listen to a vocalist – particularly one as special as Paul Rodgers, I really would rather like to hear him sing, rather than the couple of thousand bellowing clowns around me. Yep – “Feel Like….” swiftly degenerated into a depressing Rodgers-led karaoke. And it would not be the first time there would be an almost Las Vegas feel to proceedings. Clearly all those years of playing to Stateside stadia – not to mention his stint impersonating Freddie Mercury – have clearly helped evolve Rodgers into more of an “entertainer” than merely just the front man in a rock ’n’ roll band. Cue much grinning out across the audience and scampering about with a radio mike. Title tracks from the Run with the Pack and Burnin’ Sky albums soon followed and they were pleasant enough – but they really highlit another problem with Bad Co IMO, in that beyond their first two albums, there is not a whole load of depth of quality to their back catalogue. Rodgers strapped on an acoustic guitar midway through proceedings, and introduced Crazy Circles – hey, that was the b-side from my single! A breezy, jaunty little ditty but as unlike Bad Company as one could imagine - yet enjoyable for all that. Things began to crank up towards the finale with first Movin' On then my fave BC tune Shooting Star. I always felt this last-named to have somehow been written for Paul Kossoff (even though he was still living at the time of original recording). Although the selection of departed faces (Janis Joplin, Keith Moon et al) shown on the stage backdrop suggested the song’s inspiration had perhaps been rather more generic. I did not recall seeing Andy Fraser’s image up there, oddly enough. Although given he passed away at the age of 62, Rodgers' former Free band mate was perhaps too long in the tooth to be regarded as a Shooting Star. The main set closed with my single: Rock 'n' Roll Fantasy, which pleased me no end. Although I have to admit to scooting off before the second encore – the rather lightweight Seagull – in order to miss the Hydro traffic.